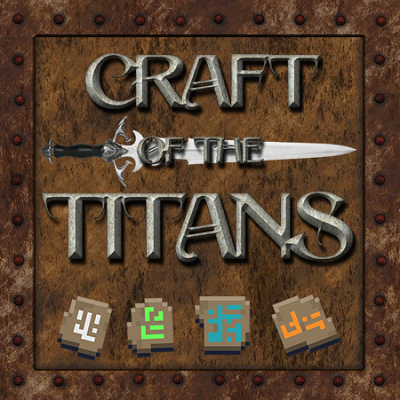 In Craft Of The Titans you assume the roll of a modern day Pioneer, sent to new lands to secure resources for your war trodden homeland. This new land is brewing with danger, at the pinnacle of which are the Titans. The Titans are boss creatures that rule over the many dimensions, including The Abyssal Wastelands, The Aether, and of course the Overworld, The Nether, and The End. In less RP terms, your goals in this pack are to become as powerful as the foes you face and bring down nearly 20 different challenging boss "Titans". Every inch of the mods in this pack have been customized to blend together in a progressive and challenging way. This IS a difficult modpack, but maybe not in the same was as you are used to. In addition to resource heavy recipe changes, mobs have ruthless AI that scales as you continue through the story. Experience Minecraft combat more explosive than ever. We don't leave you empty handed though. All of the weapons and armor have been rebalanced and buffed. You can use Axes, Bows, Spells, Swords, and more... each are balanced to be as strong as the next. Fight how YOU want to fight. Pressing the " ~ " tilde key will open the quest book with over 200+ unique quests. A new class of "daily" quests open that will challenge your ability to automate and manufacture. You can send large bulk Care Packages of goods and materials back home in exchange for powerful Titan Runes and materials. Craft hard to get end game items, or use the Dire Crafting Table to assemble Creative weapons and tools. There is always more to the story in Craft Of The Titans. Create your own Craft Of The Titans server with a single click from our partner ServerMiner. Click here and get 20% off with promo code Boolyman. No technical knowledge required and instant setup! You need at least 6GB of RAM to run this pack at it's smoothest. If you experience immediate frame stutter and FPS issues go to your options and change the MipMaps to zero. Its a known bug. If a patch updates the Quest Book, make sure to run the command "/bq_admin default load" to reload the changes into your current world save. So I was wondering what mod is in that pack that is displaying the block names? I thought it was WAILA however i don't see that in the mod pack anywhere. The UI for that mod is currently sitting on the left side of my screen and i want to move it to the middle but cant find a config for it. Hi, love the pack and I wasn’t sure where to post this but the Creosote Oil texture isn’t showing up for me inside the coke oven or even when it’s pumped out. It’s showing that missing texture and it won’t let me craft anything with treated wood. I know of an issue that’s related to the Minecraft Forge but I honestly have no idea how to fix it. Not sure if this counts as an issue but I thought I should warn people that Out of the Wood Works requires an oak part builder specifically. Not nice to find out when you live in a massive spruce forest. Anyone know where the 1.29 server files are? There will be an update coming out tomorrow that will have the server files on it. What mod show a bar on the top of the screen with highlight block? The One Probe. Feel free to join discord for general questions. Thanks, can i get an invitation to discord? when i try to create spells from ars magica 2, the book that is created from the inscription table opens up to the only text being "*invalid book tag*". is there any current fixes for this? otherwise ars magica 2 is basically useless for me in this modpack. So I'm trying to run this modpack on version 1.27b for a server I created. I tried to run this modpack and made it to phase 1 of initializing mods and it froze at the mod Ender IO. I'm not sure what to do about this, I was really looking forward to playing this modpack with friends but it doesn't seem to want to work. Is there anything I can do to make this work? How to play this modpack? when i download i'm not getting any mods. Every Mob dropps the Airship Kit MK I + MK II and another strange Item. We started yesterday with the recently released Version and we play in LAN - Changed nothing in Settings. Guess thats not intented? Any suggestion how to fix it? I'm challenging the quest "Gettin Wood, Indeed" now. However, I am in trouble because I can not find Phantom Wood of Ad Inferos. Is this tree native to Nether? Or are you crafting by some means? Those trees are only found in the Nether. I will explore the Nether a little more. Some recipes are still not craftable. Buckets, chests, solid fuels, servos, pistons. It is not that I don't understand the recipe is different. When you put everything into the crafting table you cannot take it out. The game will not give you these items. I have confirmed this with other players as well. I even cheated in the mats and still cannot make this work. On the quest everything has a purpose i can not get detect/submit to work with 6 scrap boxes in my inventory.